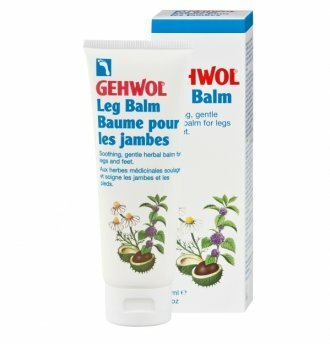 A massage with GEHWOL Leg Balm soothes leg discomfort. The naturally beneficial ingredients are rapidly absorbed by the skin. Allantoin, an ingredient in horse chestnut, bisabolol, a constituent of camomile, and panthenol have a soothing effect on skin discolouration and redness. Select plant ingredients including witch hazel extract work to soothe irritation and provide a mildly astringent effect. Ingredients: Water (Aqua),Glycol Stearate SE, Isopropyl Palmitate, Propylene Glycol,Triceteareth-4 Phosphate, Witch Hazel (Hamamelis Virginiana), Destillate,Panthenol, Bisabolol, Allantoin, Menthol, Fragrance (Parfum), Alcohol Denat, Climbazole, Imidazolidinyl Urea, Ethylparaben, Guaiazulene, PEG-35 Castor Oil.